The company has started Tractor business. And all those things which were promised are done as the company has launched and shipped its new products to the United States. The amount given to TransStadia will be collected by this quarter end and everything is as per schedule. Debt is taken for the CAPEX purposes only, it will go down year-on-year as company is aiming to reduce or maintain working capital requirement. Realization per clutch is around Rs. 5000- 6000 depending upon the size, for a dual clutch compared to around half of that for a single clutch. So, margins are better. Foundry business has improved its operations and subsidiaries are doing well, new products have been launched, diaphragm spring production is also doing quite well. So, as soon as the market starts going up, overall performance is expected to be better. After getting inquiry from major automotive players, it has been concluded that the company’s quality of product has been appreciated. Also, the cleanliness of the process and the modernized equipment which meet the environment standards have played important role for company’s international customer companies. Some of the leading tier 1 manufacturers from Europe have rated the company quite highly as a foundry after getting quality certification, nonconformance repots and getting all NCRs closed. Because of GST, the carry forward of excise duty benefit was not clear and therefore all the distribution channels were to hold minimal stock. So, profit is hit by 7-7.5 crores. Because of the conversion of inventory from BS III to BS IV, OEM segment production is affected and it is down 42%. Since the increase in prices of commodity has not been materialized, taking place in Q2, has impacted margins. The company is aiming around 15% for the margins, which will bring 570-580 crores. 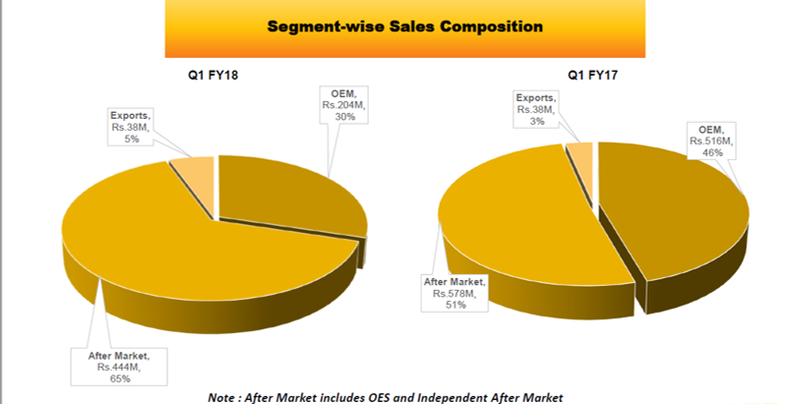 As the market is shifting from single clutch to double, the company has chosen dual clutch segment and this segment is expected to grow by 30-40% YOY and can go to as high as 60% of total market. Market is approx. 600000 tractors per year. The dual clutch segment consists of 50-60% of total market out of which the company has got 20%. So, this indicates that the business to be a 100 plus crore business in the next 24 months. Over the next two years, the company will add 3 customers to the dual clutch segment and for this the company is in talk with all the OEMs. And all of them are very keen.Some of them are: M&M, Swara, Eicher, TAFE, CNH and Escorts for various stages. In FY19, the company is looking at Rs 150-170 cr. as total annualized turnover. As it is a starting period for the company and it is a vertical modeling line which is fully automated, the company expects 70-73% utilization. In case the company might not be getting best profits internally, it is looking out for outside business to get higher realization of margins.